When meditating upon the Annunciation mystery it may be useful to look at a picture of the Annunciation or even listen to some soothing, uplifting music. The Angel Gabriel appears to Mary, a young Jewish girl. Gabriel greets Mary saying, "Hail, full of grace, the Lord is with thee: blessed art thou among women." Luke 1:28. These familiar words is how Mary is greeted in the Hail Mary Prayer, the main rosary prayer. Gabriel is declaring that Mary is holy. She never had original sin, in the words of the angel, she is "full of grace". Now because Mary is a virgin she is puzzled and asks the angel how this is possible. Mary knows about the promise of a savior and is well informed of the Messianic prophesies of the Old Testament. However, when you look at her comments to the angel, Mary obviously doesn't fully understand all that is happening to her but she answers in the most obedient and confident way. Mary always conforms her will to that of God's. Imitating Mary's attitude toward God's will is a sure way to bring peace to your life. Here are some additional thoughts to enhance your meditation on the Annunciation Rosary mystery. Return often to this page when you are praying the Joyful Mystery of the Rosary - The Annunciation. 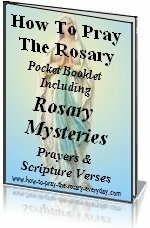 If you would like to add your own meditation to the Rosary mystery, please go here. By adding your own meditation you are actually building your own web page on our website. You can add a picture and even continue adding meditations. Other people can rank, comment and contribute to your meditation page and you can comment on their comments. They don't have to be elaborate meditations, but they do have to pertain to the mystery. It's always fascinating to see meditations from the eyes of others and our Rosary community appreciates new meditations. Mary is immaculate. She was conceived without sin. Archangel Gabriel declares so here when he uses the words full of grace to describe Mary. Mary was free from all stain of sin. Jesus picked her from all eternity to be His mother. He could only share flesh with a pure and unblemished Mother. Mary also called herself by this title at Lourdes. Mary's initial response to the angel's praises is silence. Mary is uncomfortable with the angel's greeting because she doesn't see herself as anything special. The more the angel exalted her the humbler she became. Mary is the first to hear the "Good News"
Mary is at enmity with Lucifer (Satan). Lucifer was impressed with his own brilliance and in his pride thought himself better than God. Because Mary was a devout Jew, she knew that the promised Messiah would come and save her people as God had promised. Surely she prayed that God would send this Messiah. In these words of Jesus, you see the significance of the example Mary demonstrated at the Annunciation. Gabriel means "power of God"
Just as you sometimes don't understand why certain things happen to you, Mary didn't fully understand what was happening to her. Nevertheless, Mary said "I will" to God. Follow her example of trust and confidence in God's plan for you. No matter how confusing they may seem. "Behold the handmaid of the Lord; be it done to me according to thy word." -Luke 1:38 Mary's Fiat. This is the most powerful answer that could be given. One final thought for meditation comes from St. Alphonsus Liguori in The Glories of Mary. 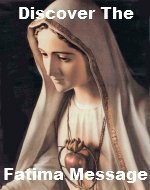 Mary "is infinitely inferior to God, but immensely superior to all creatures; and as it is impossible to find a Son more noble than Jesus, so is it also impossible to find a Mother more noble than Mary." Dear Lord, thank You for coming to this world through your spotless, virgin mother Mary. Through her humility and willingness to do only the will of God, Your greatness has been manifested. Please increase in me the virtues of faith, obedience, and humility so that by imitating Your Mother I may find consolation in all my trials. Blessed and humble was Mary when she received the news that she would bring into the world our Savior.